Valentine's Day is the day in which we celebrate that wonderful moment of falling in love, exchanging gifts, to remind one another of the importance, the beauty and the pleasure of being "touched" by Eros. In honor of the many foreign students, arrived in our Master's Degree program from all over the world, we will take you to discover how this anniversary is celebrated around the world. Regarding the origins of the Valentine's Day, history and legend intertwine and often get confused. There would be many variations, but all have one element in common: Love! How many countries have a party dedicated to lovers? Almost all those in the world, perhaps in different periods and dates than the classic Valentine's Day in the European tradition. We invite you to take a trip with us in the many ways of celebrating love in the world. Paris, "The City of Love" is practically the world capital of Valentine's Day, as couples from all over the world come here for this special day. At Valentine's Day, lovers in France exchange letters and postcards, a worldwide tradition that claims its origins here. The story says that the first letter of St. Valentine is due to the Duke of Orleans, Charles, since he signed his poem as “Your Valentine ". In Italy, when it comes to Valentine's Day, the story is long; at one time it was celebrated as a spring festival. Couples spent the day surrounded by spring wonders, immersed in nature among trees or pleasant gardens. They spent their time listening to music, reading poetry or simply strolling through the gardens. Today in Italy the day of love is celebrated by lovers with original and symbolic gifts, candlelit dinners and the exchange of personalized greeting cards. Even in England there is a long and interesting tradition: "secret admirers". Romantic letters and flowers are sent anonymously on Valentine’s Day. Traditionally Spaniards are known to be a passionate people and this characteristic is perfectly visible on Valentine's Day. For this day we use to give red roses to loved ones. On February 14th, "The day of friends" is celebrated in Finlanda. For the occasion they prepare creative greetings and small gifts for partners, friends and family. The principal is anonymous and everyone must find out who has remembered him on February 14th. For Valentine's Day, in Wroclaw, Poland, couples do not choose roses but padlocks to swear eternal love. These padlocks are attached to the Tumski Bridge and the key is then thrown into the river Oder. In Romania, the party of lovers is called Dragobete, and falls on February 24th. Dragobete is the son of Baba Dochia in Romanian mythology, representing the impatience of men waiting for the arrival of spring. Also for Slovenia, as for Romania, the holiday of lovers does not respect the classic date, in fact February 14 is the day in Slovenia where you start working in the fields, while the traditional party of lovers is San Gregorio, 12 March. In the United States, Valentine's Day is celebrated by everyone. Even the children exchange tickets depicting their cartoon heroes. In schools a class party is often organized for the occasion in which one exchanges gifts and cards drawn from a box with themed decorations made by the pupils themselves. In South America the Valentine's Day is celebrated in a similar way, but it is meant as a celebration not only of love, but also of friendship and is therefore called “DíaDel Amor y la Amistad ". The Chile is known as "the land of poets", and it is true that Chileans have a very romantic people. The " Dia de San Valentin " is anticipated greatly by lovers. The Chileans love to celebrate and Valentine's Day is a special occasion for couples, who celebrate it with real emotion. It is typical to walk around the city and see the decorations all around the shops, shopping centers, the streets are decorated with flowers, balloons and wreaths made to heart. As in Romania and Slovenia, also in Brazil the day dedicated to lovers does not come on February 14th, but on June 12th, and is called Dia dos namorados. The choice of the date is that of the eve of the feast of Saint Anthony, traditionally known in the country as a saint able to make people fall in love. In Argentina, however, one day is not enough to celebrate Valentine's Day, in the country of Tango in fact in addition to the conventional date of February 14 is added a whole week in July (13-20) called “Sweetness week " during which fell in love and friends exchange sweets and kisses. While in the West Valentine's Day is celebrated on February 14th, in China this festival is held on the seventh day of the seventh month of the Chinese lunar calendar. 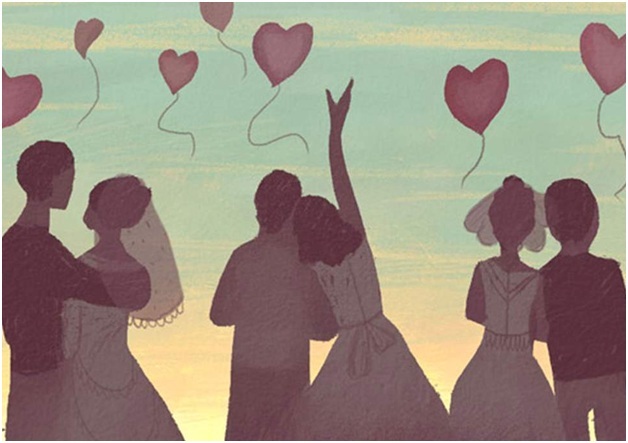 On this day many young people manifest their love while singles pray and hope to find the love of their lives. In many parks, different meeting activities are organized for singles so that they can publish their information to introduce themselves to each other. In the Chinese web pages "the seventh night of the seventh month" becomes the warmest time. However, most of the gifts brought are equal to those of the West, although there is to pay more attention: especially the choice of flowers must be well thought out given their different meanings. For example, those who give a bouquet of yellow roses must be careful as they symbolize a declaration of separation. If flowers are a symbol of romance then Taiwan can boast the most romantic celebrations since it is known for its flowers. There we celebrate Valentine's Day twice a year: February 14th and July 7th. Here people give bouquets to their loved ones. According to the Taiwanese tradition, the color and the number of donated flowers symbolize an important message; red roses represent "the only love"; ninety-nine roses represent "eternal love"; one hundred eight roses represent the question "do you want to marry me"? The Japanese celebrate Valentine's Day on February 14th, but more than the day of love, it is the day of "work and women". The difference is that the gift is not necessarily directed to boyfriends and husbands: girls can also donate chocolates to their employer or colleague. The men who receive chocolate on Valentine's Day must return the gift received by giving white chocolate a month after Valentine's Day (i.e. March 14 it is known as White Day). In Tokyo, April 14 is instead the "Black Day". On this occasion, those who did not receive chocolate either on 14 February or on 14 March ordered spaghetti spaghetti black, as a symbol of their own sadness and solitude. We close our excursus in the Philippines , where the Valentine's Day is very heartfelt, is one of the most popular festivities by young people of the country. So much, that often lovers are willing to buy expensive bouquets at twice the price of a normal day. Fortunately for those who live or are in Manila there is always the possibility of the Dangwa Market, one of the largest markets in the country, entirely dedicated to flowers.